11th lunar month of 1823: he appears on stage for the first time, at the Ichimuraza, where he receives the name of Ichikawa Shinnosuke II during the kaomise performance. 3rd lunar month of 1825: Ichikawa Shinnosuke II takes the name of Ichikawa Ebizô VI. 3rd lunar month of 1832: great shûmei at the Ichimuraza for the Naritaya guild. His father Ichikawa Danjûrô VII takes back the name of Ichikawa Ebizô V and Ichikawa Ebizô VI, who is only 9 years old, becomes Ichikawa Danjûrô VIII. Danjûrô plays the role of Hidari no Jingorô in Tsuruya Nanboku IV's drama "Sumidagawa Hana no Goshozome". He also plays the role of the uirô peddler Toraya Tôkichi in a "Uirô Uri" scene (Kabuki Jûhachiban) which is included in the drama "Sukeroku Yukari no Edo Zakura". 11th lunar month of 1832: Danjûrô plays Nose Tarô, the leading role of the "Shibaraku" scene, in the Kawarasakiza kaomise program "Tanomiaru Gohiiki no Tsuna". 1st lunar month of 1833: Danjûrô's rank in the Edo hyôbanki, sôkantô section ("global leader"), is jô-jô-kichi (superior - superior - excellent). 5th lunar month of 1833: Danjûrô plays at the Ichimuraza the role of Irie Tanzô in the classic "Yoshitsune Senbon Zakura". 7th lunar month of 1835: Danjûrô plays at the Ichimuraza the role of Ranmaru in the drama "Konoshita Kage Hazama Gassen". 4th lunar month of 1836: premiere at the Moritaza of the drama "Hakkenden Uwasa no Takadono"; Danjûrô plays the roles of Inue Shinbê and the monk Shakuunbô [casting]. 1st lunar month of 1838: Danjûrô becomes zagashira at the Kawarasakiza. He plays 4 roles in the new year drama "Fude Hajime Mazebari Soga", including the roles of Kojirô and Atsumori in the classic "Genpei Nunobiki no Taki". 3rd lunar month of 1838: Danjûrô plays at the Kawarasakiza the 2 minor roles, including Sugiômaru, in the classic "Sugawara Denju Tenarai Kagami". 3rd lunar month of 1839: premiere at the Kawarasakiza of the dance program "Shiki no Nagame Maru-ni-I no Toshi", which is made up of four dances dedicated to the four seasons and stars the actor Sawamura Tosshô I, supported by Ichikawa Ebizô V and Danjûrô [more details]. 3rd lunar month of 1840: première of the dance-drama "Kanjinchô" at Kawarasakiza. The main role (Benkei) is played by Ichikawa Ebizô V. His stage partners are Ichikawa Kuzô II (Togashi) and Danjûrô (Yoshitsune). 8th lunar month of 1841: Danjûrô plays at the Kawarasakiza the role of Katô Masakiyo in the drama "Ehon Taikôki". 6th lunar month of 1843: Danjûrô plays for the first and last time the role of the wicked priest Narukami in the drama "Mayoi no Kumoiro ni Narukami", which is staged at the Kawarasakiza. His stage partner in the role of Princess Taema is Onoe Eizaburô III. 11th lunar month of 1845: Danjûrô plays at the Kawarasakiza the roles of Matsunaga Daizen and the sumô wrestler Tetsugadake in the dramas "Ehon Taitôki" and "Sekitori Senryô Nobori". 8th lunar month of 1848: premiere at the Ichimuraza of Nishizawa Ippô's drama "Eiri Shôsetsu Asagao Monogatari"; Danjûrô plays the role of Miyagi Asojirô/Komazawa Jirozaemon [casting]. 3rd lunar month of 1849: Danjûrô plays for the first time the role of Musashibô Benkei in the dance-drama "Kanjinchô", which is performed at the Kawarasakiza. His stage partners are Ichikawa Kodanji IV (Togashi) and Bandô Takesaburô I (Yoshitsune). 8th lunar month of 1849: Danjûrô plays at the Kawarasakiza the eponymous role of the drama "Kagekiyo". His stage partners are Onoe Kikujirô II (Akoya) and Bandô Hikosaburô IV (Shigetada). 11th lunar month of 1849: Danjûrô plays at the Kawarasakiza the role of Hiranoya Tokubê in the drama "Sonezaki Shinjû". 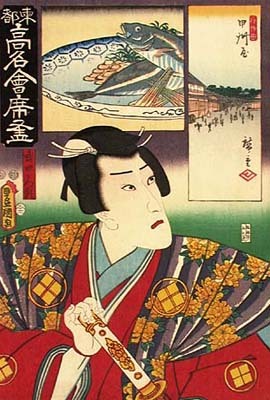 The role of the courtesan Ohatsu is played by Onoe Kikujirô II. 9th lunar month of 1850: premiere at the Nakamuraza of the drama "Minoriyoshi Kogane no Kikuzuki"; Danjûrô plays the roles of Asayama Tetsuzan and Funase Sanpei [more details]. 2nd lunar month of 1851: premiere at the Ichimuraza of Sakurada Jisuke III's Kiyomoto-based dance "Akegarasu Hana no Nureginu", commonly called "Urazato Tokijirô"; Danjûrô plays the role of Kasugaya Tokijirô [casting]. 5th lunar month of 1851: Danjûrô plays at the Ichimuraza the role of the wicked priest Narukami in the drama "Narukami". The role of Princess Taema is played by Bandô Shûka I. 7th lunar month of 1852: premiere at the Kawarasakiza of Kawatake Shinshichi II's drama "Jiraiya Gôketsu Monogatari"; Danjûrô plays the role of Jiraiya [casting]. 3rd lunar month of 1853: premiere of Segawa Jokô III's drama "Yowa Nasake Ukina no Yokogushi" (commonly called "Kirare Yosa"), which is staged at the Nakamuraza and in which Danjûrô plays the role of Yosaburô [casting]. This performance is a huge success. 5th lunar month of 1853: Danjûrô plays at the Nakamuraza for the second and last time the role of Yosaburô in Segawa Jokô III's drama "Yowa Nasake Ukina no Yokogushi". The role of Otomi is played by Onoe Baikô IV. 8th lunar month of 1854: a few days after his triumphant arrival in Ôsaka, where he is supposed to perform together with his father, Danjûrô commits suicide in his inn. Ichikawa Danjûrô VIII playing the role of Takeda Katsuyori in the drama "Honchô Nijûshikô"